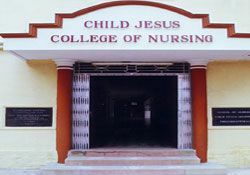 The Child Jesus College of Nursing, which was started in 2006 affiliated to the Tamil Nadu Dr.M.G.R. Medical University, and recognized by the Indian Nursing Council, offers the degree course in B.Sc. Nursing. The school of Nursing, Child Jesus Hospital is a highly reputed institution, since its inception in 1952 as the midwifery school in advanced Grade English Medium, was recognized by the Madras Nurses and Midwives Council. In 1956, addition to the English Medium a Tamil Medium Midwifery course was also recognized. This was replaced by the A.N.M. course in 1964. In 1966 General Nursing and Midwifery course was started, the duration was 3 years and 6 months. And in 1989 the revised syllabus implemented and the duration was 3 years. The new revised syllabus is being implemented since 2007 and the duration is 3 years 6 months.